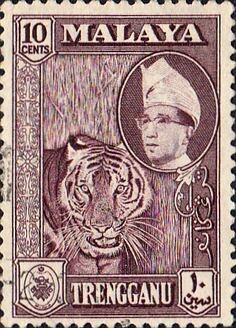 He was the Sultan between 1938–1942 (with a break during the Japanese Occupation) and again from 1945-1960. 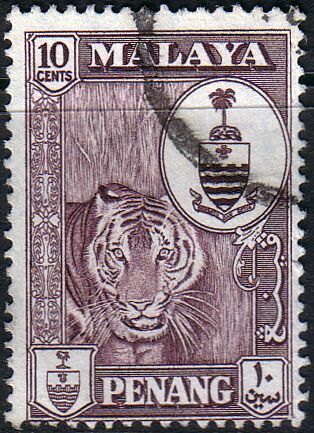 It seems the tiger was a popular image and was used for the other states as well though each with a different image in the medallion. In the bottom plates of each the left shows the coat of arms and the right the value. 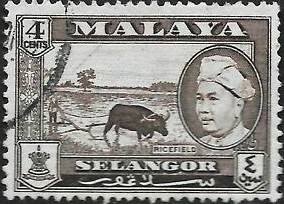 The stamp for Penang has in the medallion the coat of arms while the one for Trennganu (now known as Terengganu) has Sultan Ismail Nasiruddin (full name Almarhum Sultan Sir Ismail Nasiruddin Shah ibni Almarhum Sultan Zainal Abidin III). 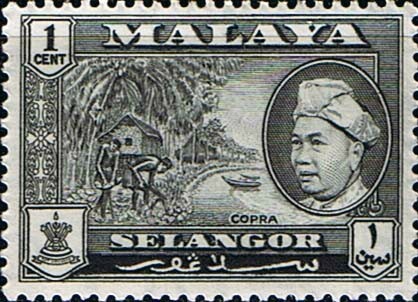 His reign as Sultan lasted from 1945-1979. I think that vintage stamps will win today's theme. These are fascinating. I like old stamps that show local scenes in this way. Love the tigers. I have one from the state of Perak. Greenland have some superb stamps www.mark-greenand.blogspot.com Seeing your stamps has made we want to pour over my collection that I still have tuckrd away from when I was a Kid, I'm now 53! Love stamps. Great blog.Regards,Mark.